The most easiest and delicious Biryaani Recipie Ever ! Biryani is a traditional rice recipe in South Asia. Biryani is actually very special and popular main rice dish in India and Pakistani cuisine. Particularly in Hyderabad, India and in Karachi, Pakistan. Biryani is considered part of the Muslim Food in Indian cuisine, so Biryani is usually more popular in regions with significant Muslim population. 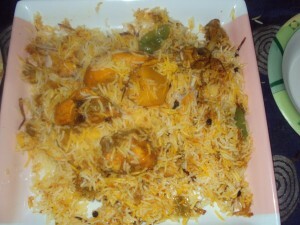 Biryani is also served on special occasions weddings, parties, Eid-ul-fitr, Diwali etc. There are many varieties and flavors of Biryani such as Hyderabadi biryani, Sindhi Biryani, Shan Biryani, Prawn Biryani, Vegetable biryani and many more. Making Biryani is considered a bit difficult and time consuming. Traditionally Biryani is prepared using a combination of spices and preparing all these spices takes time. So today I am sharing with you a very special Biryani recipe which is very simple and easy to make. It is Chicken Biryani recipe and its very delicious biryani recipe, despite the fact that we are going to make it the easier way there will no compromise on taste. Soak the pounded saffron in the hot milk and keep set aside. Wash and soak the rice in plenty of water for 2 hours. Heat oil in a pan and fry slice onions till golden brown. Drain and keep set aside. Peel and cut potatoes into small pieces, wash and keep set aside. In the same oil , add chicken and saute for 2-3 minutes on a low flame. Add cumin seeds, bay leaves, green chilies paste, red chili powder, salt, yogurt, ginger paste, garlic paste, cloves, black peeper, cardamon, green cardamon, cinnamon stick, lemon juice, potatoes, and few drops of yellow food color. Cook till chicken and potatoes completely done and oil start to separate. In a big pot bring water to boil, add some salt, green chilies and rice for boiling. Continue to cook until the rice almost done. It takes about 10 minutes on stove. Drain the rice and keep set aside. Now its time to arrange rice and chicken layers. You should have two layers of rice and one layer of chicken gravy. Top it off sprinkle saffron milk and fried onions. Simple and easy chicken biryani is ready to serve. Before serving mix the rice well and serve hot with raaita and slice onions. This entry was posted in food, Uncategorized and tagged biryaani, biryani, chicken biryaani, chicken biryani recipe, chilli paste, dinner, easy and delicious biryaani, food, ingredients, most easy biryani recipie, pakistani food, tsp cumin seeds, vegetable biryani, vegetarian, yellow food color.